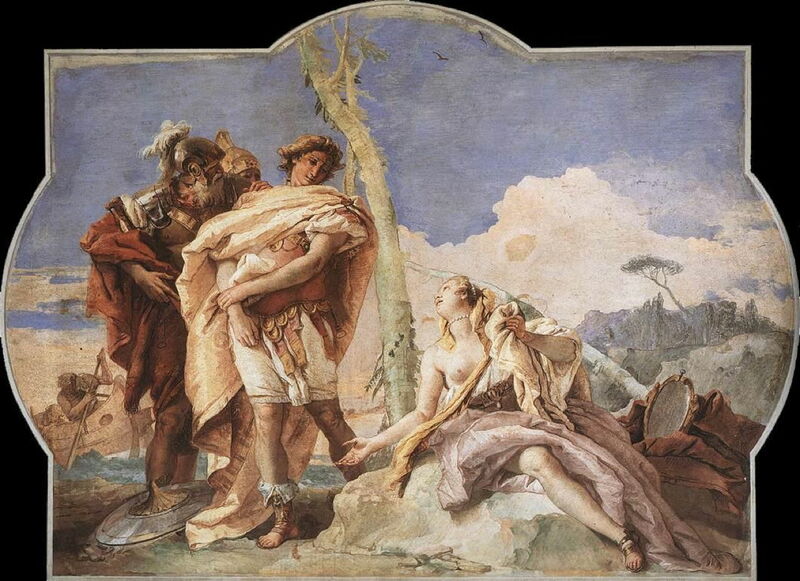 Giovanni Battista Tiepolo (1696–1770), Rinaldo Abandoning Armida (1757), fresco, 220 x 310 cm, Villa Valmarana ai Nani, Vicenza, Italy. Wikimedia Commons. The ‘Saracen’ sorceress Armida had abducted the crusader knight Rinaldo to her enchanted garden far to the west, on the Fortunate Isles. A rescue team of the knights Charles and Ubaldo sailed out in a magic ship piloted by a fair woman. After they had overcome a series of obstacles, Charles and Ubaldo found Rinaldo dressed and behaving as a woman’s dandy, and then had the task of restoring his senses as a warrior knight, so that they can take him back to rejoin the siege of Jerusalem. By showing Rinaldo his own image in a highly polished shield, the knight realises what he has become, and is put to shame. Ubaldo bids him rejoin the forces of Godfrey of Bouillon, and the holy war. They hasten away, leaving Armida weeping and choking with grief. She runs after them, calling him back. Rinaldo and his two companions wait for her, and the couple stare at one another in silence. The scene of Armida and Rinaldo separating has proved another of Tasso’s great images for art. Its greatest exponents were the Tiepolos, father and son, who during the eighteenth century painted a succession of works showing this parting. I show here four examples, each of which uses the compositional device of collapsing Armida’s garden on one side, with the beach and ship on the other, and using that spatial and temporal merging to tell the whole sequence, from Rinaldo’s awakening to their departure by sea. Giovanni Battista Tiepolo (1696–1770), Armida Abandoning Rinaldo (1742-45), oil on canvas, 186.7 x 259.4 cm, The Art Institute of Chicago, Chicago, IL. Image by Sailko, via Wikimedia Commons. 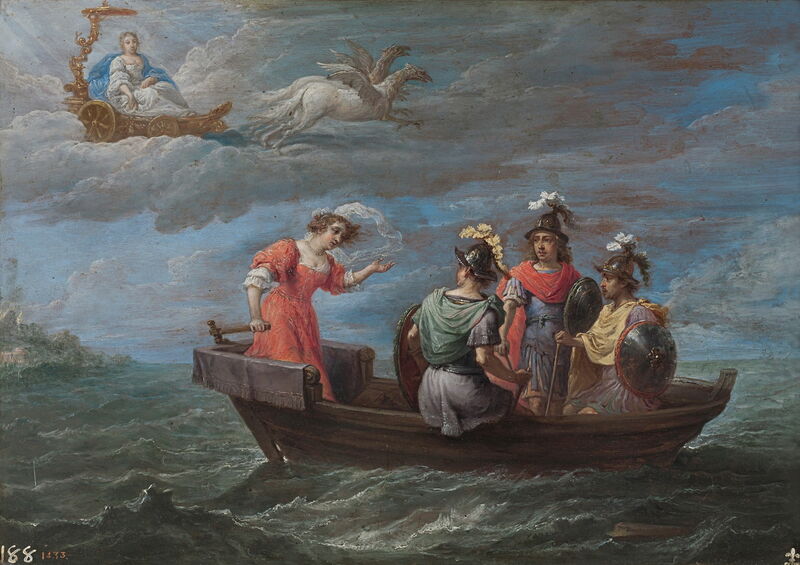 In this version for the Tasso Room in the palace of the Cormaro Family in Venice, painted in 1742-45, Charles and Ubaldo are stood in full armour, pointing to their ship which is waiting to take Rinaldo away. Armida lies back exposing a great deal of leg, trying to persuade Rinaldo to stay with her. Giovanni Battista Tiepolo (1696–1770), Rinaldo’s Departure from Armida (1755-60), oil on canvas, 39 x 62 cm, Gemäldegalerie der Staatlichen Museen zu Berlin, Berlin, Germany. Image by anagoria, via Wikimedia Commons. 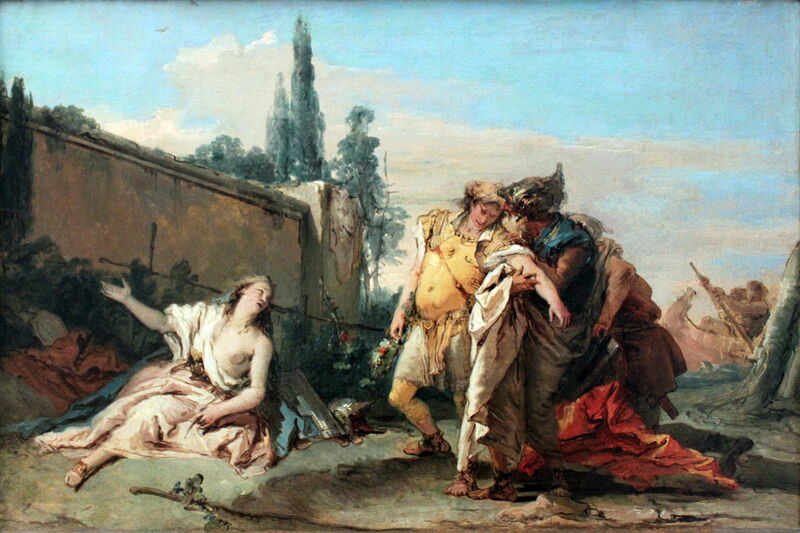 In Tiepolo’s Rinaldo’s Departure from Armida from 1755-60, Rinaldo is still being woken from his enchantment, and Armida bares her breast as she is trying to lure him back to her. Giovanni Domenico Tiepolo (1727–1804), Rinaldo Leaving the Garden of Armida (c 1770), fresco, dimensions not known, Ca’ Rezzonico, Venice, Italy. Wikimedia Commons. His son, Giovanni Domenico, squeezed the three knights in tighter, and omitted Armida, in his Rinaldo Leaving the Garden of Armida from about 1770. Rinaldo’s separation from Armida is marked by the hold he has over the blindfolded Cupid in his right arm. This was painted in a fresco in Ca’ Rezzonico in Venice, Italy. 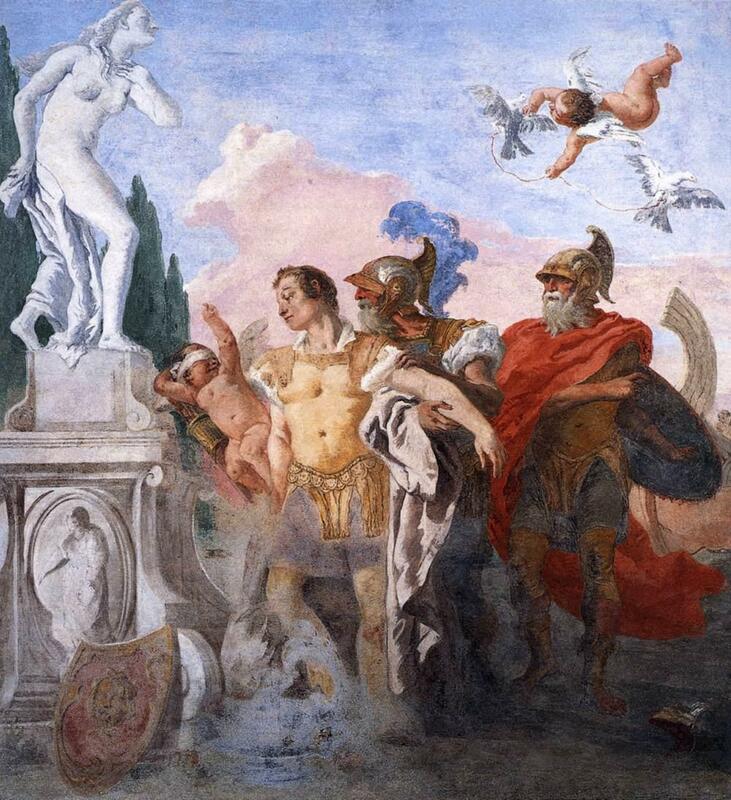 The father Tiepolo had painted Rinaldo Abandoning Armida, another variation of the figures, in 1757, as a fresco in the Villa Valmarana ai Nani, in Vicenza, Italy. 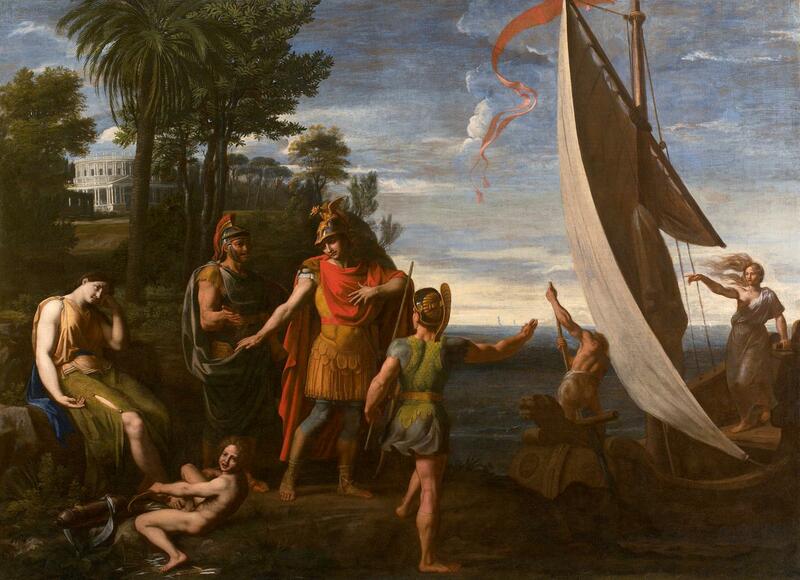 In this, the composition is reversed, with the ship at the left, and Armida at the right, pleading with Rinaldo. 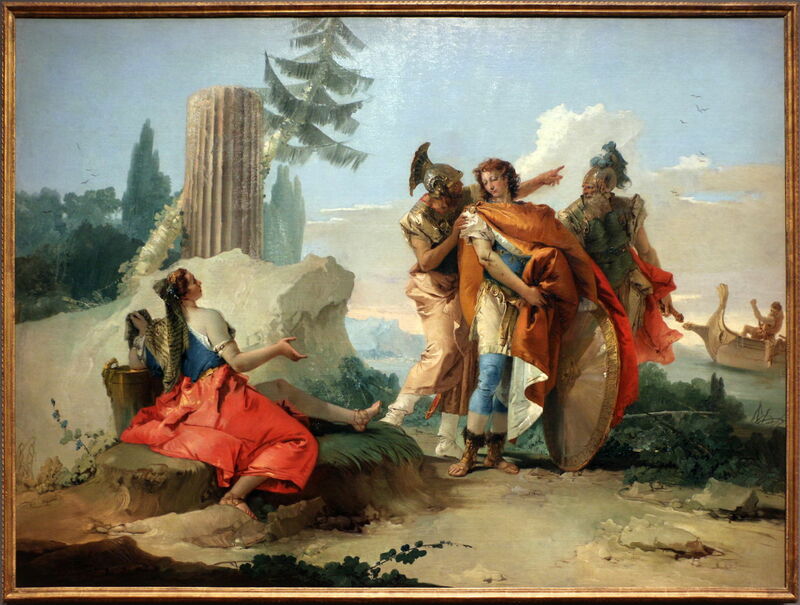 This is perhaps Tiepolo’s most complete account, as it includes both Armida’s crystal mirror at the right, and the polished shield into which Rinaldo looked, at the feet of Charles and Ubaldo. Tasso’s narrative, developed in this painting, may have a sub-text about looking and its power: for Armida looking in her crystal was a means of strengthening her allure over Rinaldo, but for him looking into the polished shield was a means of restoring his power by showing what he had become in her clutches. Nicolas Colombel (1644-1717), Rinaldo Abandoning Armida (date not known), oil on canvas, 118.1 x 170.2 cm, Private collection. Wikimedia Commons. The Tiepolos were by no means the first to merge Armida’s garden with the sea and ship. 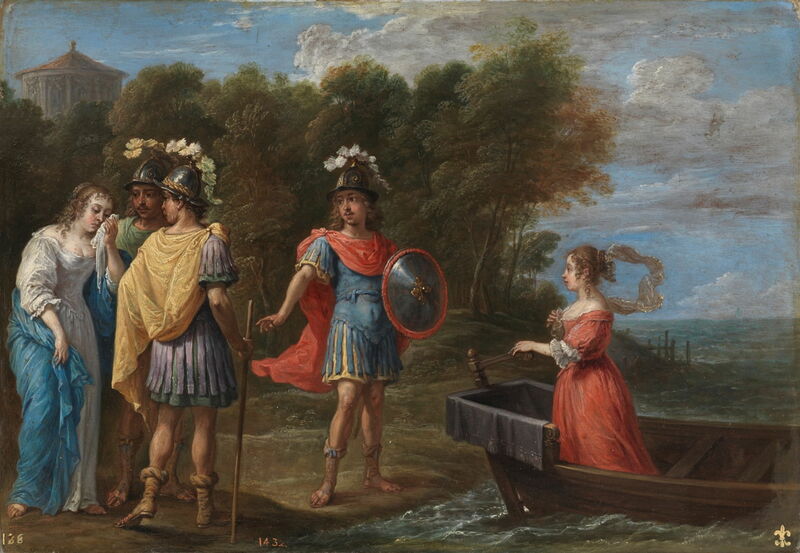 Nicolas Colombel’s undated painting from the late 1600s showing Rinaldo Abandoning Armida has done much the same. Armida then launches into a speech, asking him to let her follow him back, and offering to be his shield. His love has been replaced by compassion for her, and he asks her to remain there in peace. The three knights then sail away on the magic ship, leaving Armida behind on the beach. Her grief now changes to anger at this loss, so she casts evil spells and conjures up her chariot. On that she departs in vengeance for the battlefield. David Teniers the Younger (1610–1690), Armida and Rinaldo Separated (1628-30), oil on copper, 27 x 39 cm, Museo Nacional del Prado, Madrid, Spain. Wikimedia Commons. David Teniers the Younger shows this section of the story in two of his small paintings on copper: in his Armida and Rinaldo Separated of 1628-30, Armida is weeping and being comforted by Charles and Ubaldo, as the woman pilot of their ship waits for them to board by its stern. David Teniers the Younger (1610–1690), Rinaldo Flees from the Fortunate Isles (1628-30), oil on copper, 27 x 39 cm, Museo Nacional del Prado, Madrid, Spain. Wikimedia Commons. Teniers’ sequel, Rinaldo Flees from the Fortunate Isles, shows the group returning to war, with Armida still looking disconsolate in her chariot above them. Canto seventeen opens in Gaza, between Egypt and Jerusalem, where the King of Egypt is mustering his army ready to advance towards Godfrey’s forces. He sits on his throne to review his forces, which Tasso lists in procession much as he had done when the crusaders were setting out for Jerusalem at the start of the epic. These start with Egyptians, and progress through those from the coast of Asia, citizens of Cairo, those from the land to the south, men of Barca, those from the coast of Arabia, from the Persian Gulf, and the Indes. At the end, Armida appears riding in her chariot with her own forces who had been mustered in Syria by Hydrotes, together with Circassians and more. The king then retires to a banquet, where Armida offers her forces in support of the king, and tells of her wish for vengeance against Rinaldo. Adrastus, a ‘Saracen’ leader of Indian troops, offers to rip Rinaldo’s heart out, and make a present of his head to Armida. Posted in General, Life, Painting and tagged Colombel, Crusade, history, Jerusalem, mediaeval, narrative, painting, Tasso, Teniers, Tiepolo. Bookmark the permalink. What does the TCC Compatibility database do?